Best Hair Transplant Clinic in Dehradun ? - if you are searching this question, i think you are on right place. We are medical expert in Doondoc.com. We have done a lot of research and we will tell you who is 'Hair Transplant clinic in Dehradun'. Our data is not only dependent on the information that is searched from the internet, but we have also taken feedback from those people who have already done hair transplants. Result, service, session information is noted in detail by each patient. After that, Doondoc is presenting these results to you. Dr. Jyoti Malik, a known dermatologist of Dehradun, her clinic Kutiz Skin and Laser Clinic is well known clinic in Dehradun. Dr. Jyoti is not only a master of good nature but also famous for giving better results. The patient who has been treated by her are fully satisfied with the results. The best part of Dr. Jyoti malik is that she has 15 years of experience in both the dermatologist and cosmetologist. Dr. Jyoti Malik's clinic is located at Kutiz Skin & Laser Clinic in Gurgaon Sector 38, Gurgaon and Kutiz Skin and Laser Clinic in Balawala, Dehradun. 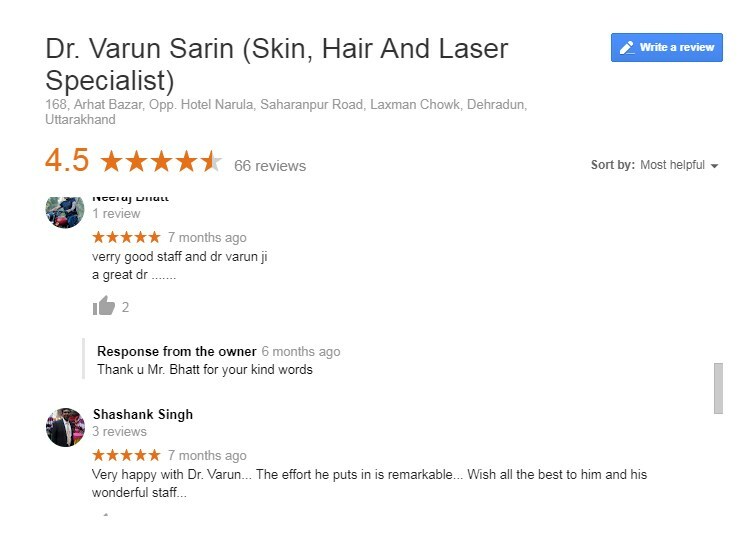 so she is in 5th rank of our Best Hair Transplant Clinic in Dehradun list. Click if you Want to Know How Does Laser Works and What will be the cost? She completed MBBS from Pt BDS PGIMS in 2000. She also completed MD - Dermatology , Venereology & Leprosy from Pt BDS PGIMS in 2004. Formely at Royal Shrewsbury Hospital (U.K). 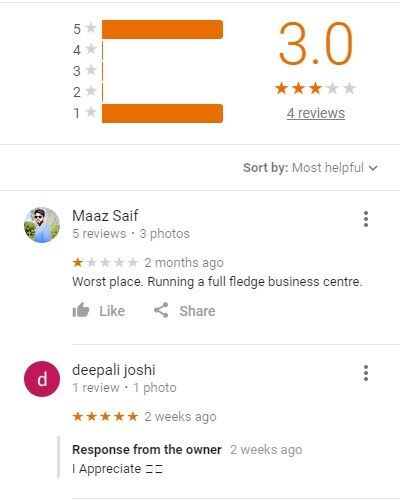 The Overall Google Rating of Kutiz Clinic is 3.2 (Three Star). Clinic got total 13 Reviews in which 4 out of 13 gave a negative feedback. if we count percentage of negative feedback is then we gets 30% Negative and 70% Positive feedback. Dr. Archana Gulati clinic is count one of the Best Hair Transplant Clinic in Dehradun. She has an experience of 17 years. She is medical director at perfect look skin and diagnostics center pvt ltd. Also experience of Dr. Archana Gulati tells that she has successfully treated all types of patients. Dr. Archana Gulati just received only 4 Reviews on Google. in which 2 out of 4 are negative and two are positive feedback. have a look on her performance from patient point of view. if we count percentage of negative feedback is then we gets 50% Negative and 50% Positive feedback. Dr. Arika Bansal is well qualified and experienced surgeon for hair transplant with an excellent safety record second to none. She has 12 years of experience as a Dermatologists in Dehradun. She has treated more than 500 hair restoration surgeries and refined her skills by attending all international conferences and workshops. Her Clinic Name is National Skin Clinic, Dehradun. 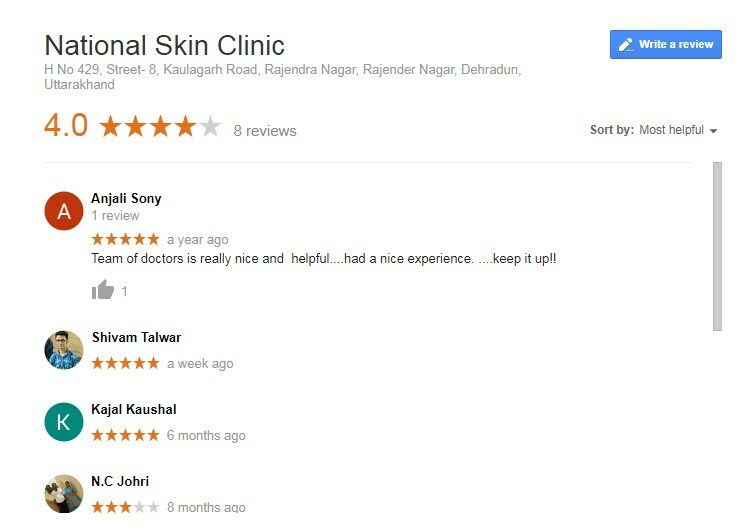 National Skin Clinic is on 3rd rank because they got 7 Positive reviews out of 8. that means single person did'nt gave them a good response. If we convert them in percentage then we gets 92% satisfied patient from national Skin Clinic. Also Discussing with the Team of DoonDoc, Senior Dr. Narendra told that we have not received any complaint from out patients also we have treat hundreds of hair transplant within non-expensive fees. Enhance Clinics is India’s fastest growing chain of hair transplant india, cosmetic surgery & dermatology clinics with 22 centers across the country. It is led by renowned surgeon Dr. Manoj Khanna, one of the best cosmetic surgeons & hair transplant India. Owner of Enhance Clinic is Dr. Manoj Khanna. Dr. Manoj Khanna is internationally renowned and one of the best cosmetic surgeons of the country who has successfully treated patients from over 65 countries for Hair Transplant and Cosmetic Surgery. With an extensive experience of 20 years in this domain, he has conducted over 4800 hair transplants with great finesse. Having treated celebrities, film stars and the who's who of the cricket fraternity, Dr.Khanna is a true epitome of excellence in his field of expertise and exudes exemplary professionalism and passion for his work. 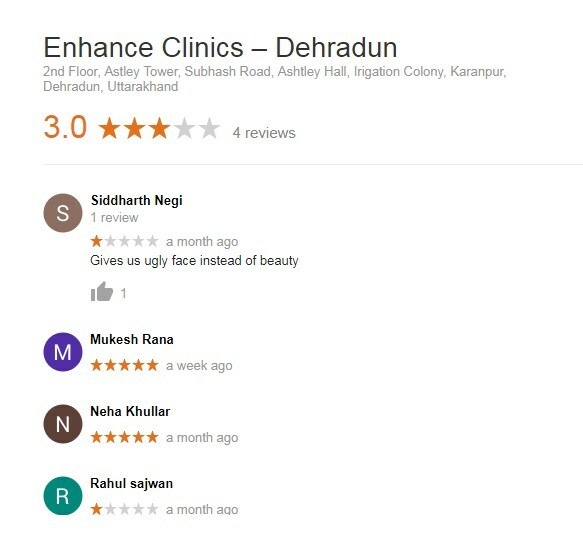 If we discuss about the feedback of Enhance Clinic Dehradun then i gets only 2 positive reviews and same as negative But enhance clinic is in our list because of it's reputation and number of patients received. Dr. Sarin’s COSMODERMA since its inception in 2014, as a small clinic has evolved into a multi-story hospital super- specializing only in the field of Dermatology and Cosmetology. COSMODERMA has become one of the most trusted and dynamic centre for patient care in clinical dermatology and cosmetology. Today COSMODERMA has a covered area of 4000 sqft, spread over 3 Floors, with dedicated and trained staff led by Dr. Varun Sarin.